Nichols retired with 361 wins, 208 losses, 1,873 strikeouts and a 2.95 ERA. 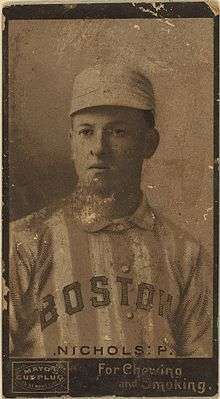 Nichols's win total was exceeded at the time only by Cy Young. His win total is the seventh highest total in major league history. His 5056 1⁄3 innings pitched ranks 11th all-time. He was the youngest pitcher to win 300 games, reaching that milestone at the age of 30. 1 2 O'Malley, John J. "Nichols Youngest to Win 300". The Baseball Biography Project. Society for American Baseball Research. Retrieved January 30, 2013. ↑ Fleitz, David (2004). Ghosts in the Gallery at Cooperstown. McFarland. p. 1887. ISBN 1476602514. ↑ "Kid Nichols Minor League Statistics and History". Baseball-Reference.com. Retrieved December 28, 2014. ↑ "Atlanta Braves Team History and Encyclopedia". Baseball-Reference.com. Retrieved December 28, 2014. ↑ "Kid Nichols Statistics and History". Baseball-Reference.com. Retrieved January 30, 2013. 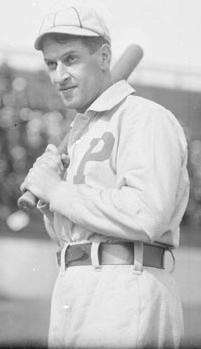 ↑ "Kid Nichols, Hall of Fame hurler, dies". Chicago Tribune. April 12, 1953. Retrieved December 28, 2014. Bogovich, Richard (2012). Kid Nichols: A Biography of the Hall of Fame Pitcher. McFarland. ISBN 0786492805. Wikimedia Commons has media related to Kid Nichols.